You must make reservations at least 5 minutes in advance of the time at Havana 59. 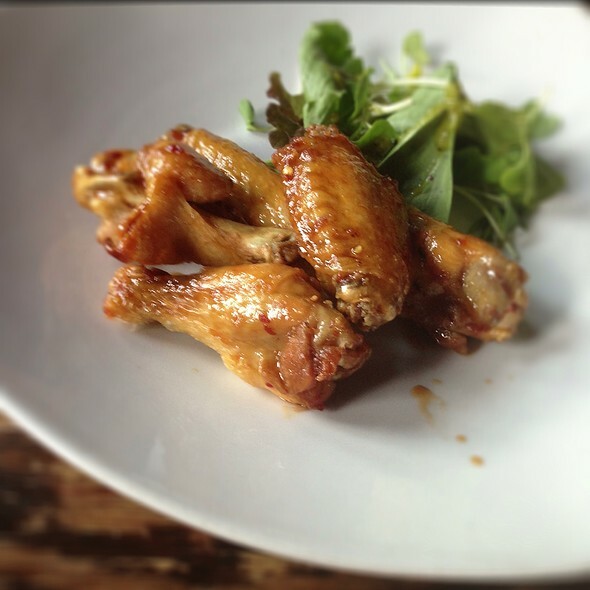 For your pleasure, the bar opens at 4:30 pm daily and stays open after the kitchen closes. Salsa dancing--Complimentary lesson usually at 8:00 pm and dancing from 9:00 pm until midnight. Thursday's ONLY! In-house catering for events from 20 to 300 guests. The string lights, crumbling plaster walls, palm trees, and aroma of cigars take you back in time to enjoy the tantalizing delights of a bygone era in Havana, Cuba. At Havana '59 we implement the tagline "A Revolution in Food" by fusing the cuisines of all cultures that have once inhabited Cuba. We take you back to the glorious days of the 1950's in Havana that were spent basking in sunshine alongside the ocean, pools of posh resorts, and on the grounds of the Havana Yacht Club. 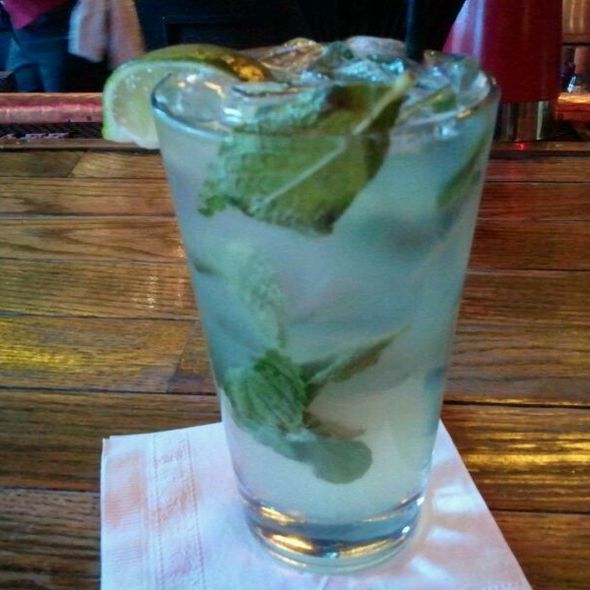 Enjoy our fresh made Mojitos or one of our specialty cocktails paired with one of our delicious entrées. 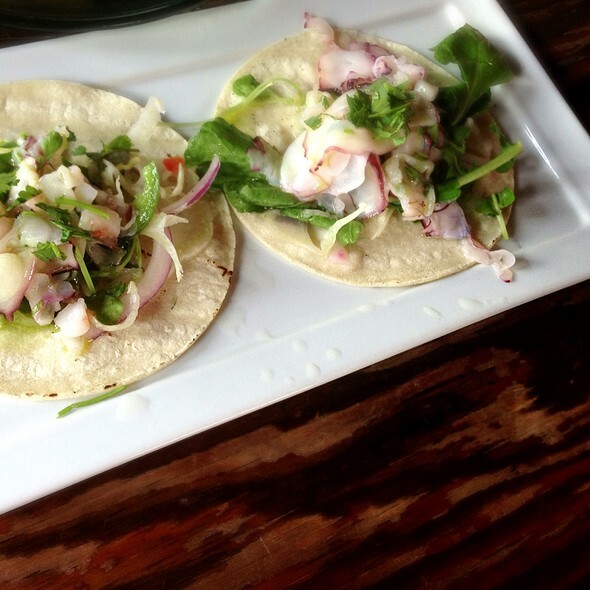 We are a from-scratch kitchen that sources our produce and seafood from local purveyors. Staff and food was excellent!!! The mohitos were the best I’ve had! Can’t wait till next trip to try the ceviche!! Our oldest son came home for one day on his way to a business conference in Fl and we wanted to take home somewhere he had never been. We chose Havana ‘59 because he had gotten us an Anniversary dinner there. He made the reservations from California and chose the entire menu including the cocktails. We enjoyed it so much we wanted him to experience it. The entire dinner was amazing! We each got a different entrees. We had cocktails, appetizers and I got a dessert. I believe that it doesn’t matter what you pick off the menu, you’ll love it. The food was very tasty. Service was very attentive. Hiwever, they don't let you substitute a side salad if you trying to avoid the beans & rice or plantains. A little bit smoky even in the non-smoking side but the atmosphere is enjoyable and the food delicious. Excellent value for brunch. Will definitely return for both dinner and brunch. We sat in the cigar bar. They had an above average cigar selection. Service was outstanding. Food was plentiful and delicious. The Hennessy Mojito was great. We had a great time! Havana 59 is always great. Been going there for years. Absolutely loved it. Good food, good drinks! Great service, great atmosphere and great food. What more can I say? 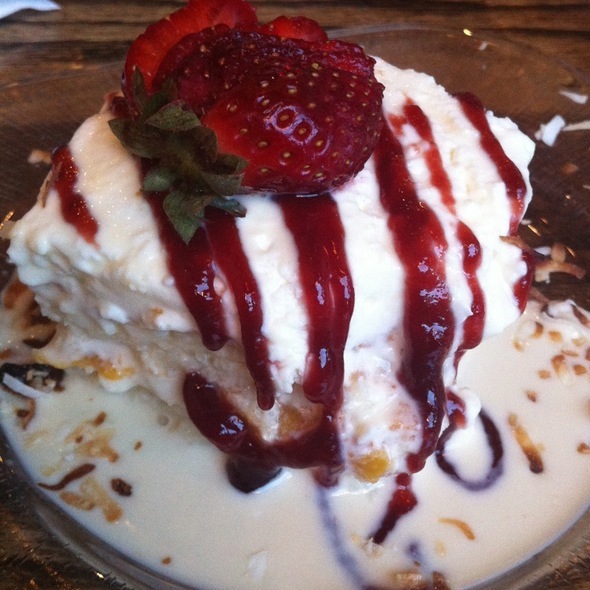 Excellent food and service - one of our favorite Richmond restaurants! One of my favorite spots, especially for Happy Hour. Best calamari EVERY! I had reservation at 4:30pm. We were seated on time, however, we were told that our food would not be cooked until 5:00. We were able to order appetizers. I ordered 2 meals that would take 30 minutes. We ordered arroz con pollo and the paella. The waitress brought us 2 arroz con pollo 1 hour and 10 minutes after we ordered it. She brought it out at 5:45 and I had an engagement to be at by 6:30pm.The arroz con pollo was very bland. I do not understand why it took so long when it was not even seasoned. Place is nice and busy. They have smoking allowed on one side with a swinging door which does not keep the smoke from entering the non-smoking side. Appetizers were delicious. The pallea was a little over cooked and needed seasoning. Would recommend place if you don’t mind the smoking. Great food and fantastic prices! Fantastic ambiance, decor, and menu. Food was pretty good. Service was friendly, felt personal, and prompt. Smoke was a little bothersome, even sitting in the non smoking section, but tolerable. Went there based on the idea that there is dancing. The website said salsa on Thursday, which lead us to believe that there would be dancing, on the weekend. We were disappointed. The website should also, clearly describe how to get there. The main entrance, in on an accessible from the street and difficult to find. The pluses: food was good and there is an indoor smoking section. Music was a little loud. Todd was amazing. Monitor were among the best. Monday night Taste of Havana deal was nice. Great atmosphere. We had a wonderful time and our server took great care of us and really made out night special. We really enjoyed the food, service, drinks, and yummy cigars! Overall, outstanding experience. We were very happy! Second visit. Repeat from first visit "Great Time"! Tried different food items on menu, very good. Definitely on our "go to list" as far as restaurants are concerned. FIRST VISIT. GREAT TIME. GREAT DRINKS AND FOOD. CAN'T WAIT TO GO BACK. The paella for two was excellent , better than Madrid. We are from out of town and enjoyed this little gem. I would recommend this place. The food was tastey. The service was fair, food took longer than expected. The vibe here with gentlemen on the open air bar side smoking cigars and salsa dancers heading for the upstairs was cool. Would go back. Food and drinks was great! Service was very slow. I’ve been going to brunch here on occasion since the first weekend they started offering brunch and have never been disappointed. This time, however, they have outdone themselves. The menu was great before but this time it was fantastic. Definetly the best brunch I have had. The Benedict was amazing even though they were out of pork belly (I substituted chorizo) and everyone else in my group of 6 was very pleased with their choices. What a great atmosphere... great food and very friendly service. Great for a friends get together! Had a celebration dinner here for 8 people. The service was terrible. Server was not attentive. Drinks were very slow to arrive. Food took over an hour to be served and some of the meals were luke warm. One person's meal came 5-10 minutes after the rest of the table. Food itself was mediocre. This is a place I want to like but they seem to do everything possible to make it a painful experience. This was to be a celebration and I had arranged for a limo for the group. The dinner took so long that I had to have the limo for an additional 4th hour. Had brunch here. Decided what I wanted until the lovely waitress told me about the crab cake special. Went with the special and it was amazing. Can't wait to visit Richmond again so I can visit for dinner. 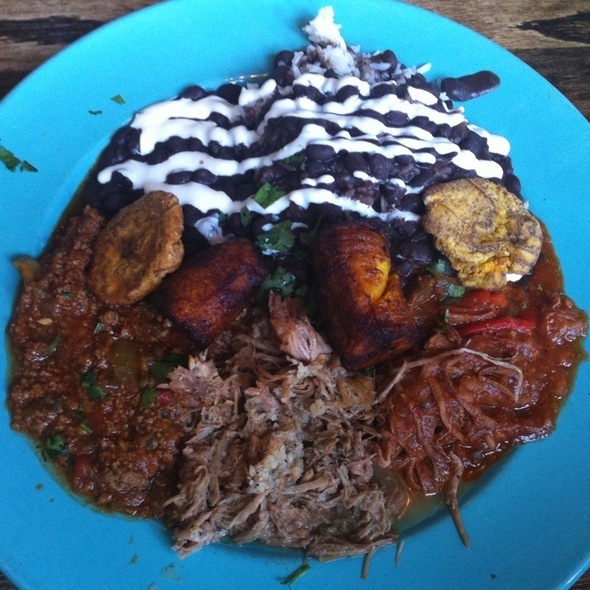 Authentic Cuban food and feel. This is a must visit. Awesome food, Jasmine our sever was friendly and very helpful!!! She is great and takes care of her customers. 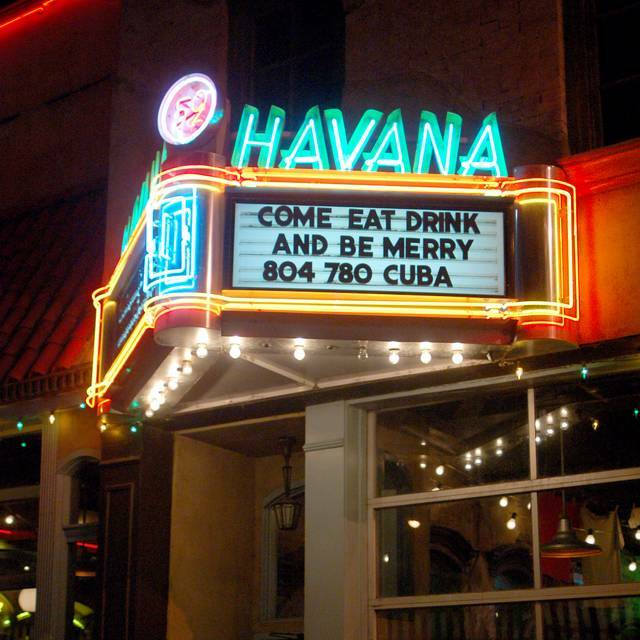 Havana 59 is always an enjoyable dining experience; Was seated promptly, was served promptly, was served attentively, and the food was deliciously well prepared. The only part of this experience that kept it from getting five stars all around is the fact that I had to ask for the check twice; The check eventually arriving at least 12 minutes after the first request almost causing me to miss the curtain at West Side Story. I could eat here everyday. I love the food and ambiance. Great place, I was dining with 9 friends and the restaurant set us up with open window seating, it was a perfect Sunday, weather was great making the dining experience near perfect. The only issue was that some of the food selections were very spicy, the restaurant should rank the spiciness of its food or warn it's patrons. We had a 10 am reservation and we were the first ones to arrive after they opened. We did have a party of 8 and it was Father’s Day, but our food took an hour to come out and it was breakfast food.